IN STORE PICKUP ONLY! For 30 years, this kid-powered ride on has been a staple in homes. Kids love being behind the wheel while adults love the durability. 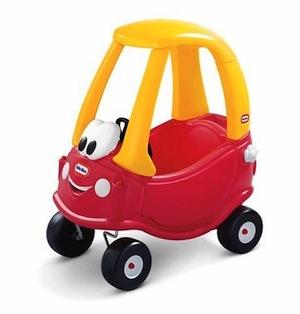 Now Cozy Coupe® is better than ever! New redesigns feature a friendly face on the front and a removable floor. Take the floor out allows kids to use foot-to-floor power. When the floor is in, little ones' feet are protected while an adult can use the cut-in handle in back to push the car. High seat back allows for improved comfort for kids and there are cup holders in the back for an over the road refreshment break. Moving, clicking ignition switch and open-and-close gas cap provide interactive fun. Front wheels turn 360 degrees and driver's side door features optional inside lock. New features include removable floor and handle on back for parent-controlled push rides. Designed with a high seat back and cup holders in the rear. Includes an ignition switch and an open-and-close gas cap. Cozy rolls on rugged, durable tires. Front wheels spin 360 degrees.